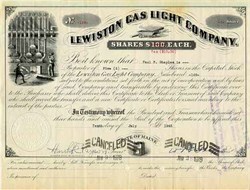 Beautifully engraved certificate from the Lewiston Gas Light Company issued in 1945. This historic document has an ornate border around it with vignettes of men working in a furnace and a coal wheel barrel with tools. This item is hand signed by the company’s president and treasurer and is over 56 years old. The company is part of Northern Utilities, Inc. as a result of a merger in 1966.